Kliknij na zdjęcie i przejrzyj wszystkie dostępne zdjęcia do Recanto da Canela Amarela. Boasting a garden, terrace, shared lounge and free WiFi, Recanto da Canela Amarela is situated in Paraty, 20 km from Paraty Bus station. Built in 2016, the property is within 20 km of Paraty Historic Centre. The property is 6 km from Quilombo do Campinho and 9 km from Cachadaco Natural Lake. At the guest house, every room comes with a desk and a flat-screen TV. Each room comes with a private bathroom with a shower. Sono Beach is 11 km from Recanto da Canela Amarela, while Santa Rita church is 20 km away. Payment before arrival via bank transfer is required. The property will contact you after you book to provide instructions. 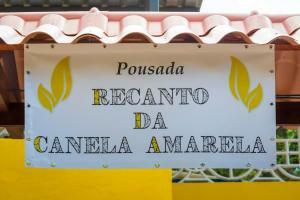 Please inform Recanto da Canela Amarela in advance of your expected arrival time. You can use the Special Requests box when booking, or contact the property directly with the contact details provided in your confirmation. This property will not accommodate hen, stag or similar parties.